Have you ever received a beautiful bunch of flowers and wondered how they might look frozen solid? No? Well, me neither! Actually, up until recently, I was more interested in keeping flowers in a good old conventional vase. But photographers are a mighty creative bunch. Provided with some of nature’s most basic ingredients, we put our heads together and discovered an amazing way to create such wonderfully abstract photographs of frozen flowers. And with such beautiful results, I wish I had started stowing my floral bouquets in the freezer sooner! There are a few methods I’ve encountered for preparing photo-ready frozen flowers. One of those methods involves the use of liquid nitrogen, but I’m going with something a little less technical. To fully encase your beautiful flowers in a block of ice, you’ll need to gradually build up the surrounding layers of ice. Usually, you could go about filling any old tray with water, throwing it in the freezer and forgetting about it until summer. 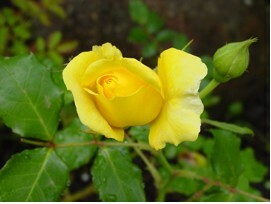 However, flowers contain oxygen, and oxygen is lighter than water. This means that chucking flowers into a full bowl of water and freezing it over is a no-go. The flowers will simply bob to the surface, stick out of the ice and wither away. Instead, have a dig in your Tupperware drawer. I’ve found that a wide and relatively shallow plastic container works best, depending on freezer space. Fill your container with a few centimeters of water. Tap water has a foggier appearance when frozen, so use distilled water if you want a glossier effect. Place your flowers face-down in the water, arrange them how you like, and place the container in the freezer. The small amount of water will freeze over, trapping parts of the flowers and anchoring them so that they can’t float in subsequent layers of water. Retrieve the container after a couple of hours, making sure the flowers are partially frozen to the ice in the container. Once the flowers are secured, pour a few extra centimeters of cool water over the flowers and existing ice. Be careful not to add too much though – the ice below can thaw and release the flowers, starting the whole process again. Return the container to the freezer. After another couple of hours (you guessed it) take the container out of the freezer again and add a few more centimeters of water. This time, you can add as much water as you like. But remember, the thicker the ice, the harder it will be for light to pass through the frozen block, cutting down the amount of light which will reach your camera’s sensor. However, ice will melt over time, so adding more water is better than adding too little. When you have added the last layer of water, take your container and pop it back in the freezer one last time. Once the uppermost layer is frozen, remove the container from the freezer and let it sit for 10 minutes or so. After the ice has separated from the container, turn the container upside down over a cloth. Gently tap the container and the ice should slide out. Voila, behold the beautiful results of your hard work! In this image, the base of the container has created an impression in the ice. You can even out the surface by rubbing a warm dampened cloth over the uneven imprint. Now that you’ve created your icy flower sculpture, it’s time to photograph it before it melts. I recommend positioning your ice block near a light source or window with natural light coming through. This allows light to penetrate the ice and the membrane of the flowers to create a more detailed subject. For my photographs, I leaned my frozen flower block against the glass petitions of my apartment balcony. Be sure to put a towel underneath the ice to avoid a wet puddle. Positioning the frozen block of flowers against natural light illuminates the details and varying tones in the image. Now that you have the technique down, have a go with different combinations of flowers and containers. Depending on the shape and length of a container, you can manipulate the density and trajectory of bubble trails frozen in the ice. Try adjusting the orientation of the container, or breaking and refreezing the ice. To make the rounded point encasing the rose head below, I lined the inside of a glass cup with a plastic bag. After anchoring the flower head to the first few frozen centimeters of ice, I gradually built up the layers of water to completely cover the rose. The air that escaped the rose was squeezed out and trapped inside the base of the glass, creating intricate patterns around the rose head. To make the ice more rounded, I simply wore the edges down with my hand for a minute or two. Line the inside of a glass cup so that the flower is easier to remove once it is completely encased in ice. Once completely frozen, I let the glass sit at room temperature, gently tugging on the plastic bag every 10 minutes or so. Eventually the plastic bag became separated from the glass, and I carefully lifted the ice from the cup, revealing the beautifully encased flower inside. A single rose, completely frozen after being positioned vertically in a glass cup. As water freezes, oxygen is squeezed out of the flower, leaving beautiful trails in the ice. Frozen flower photography is a super simple way to give your floral images a unique edge. With a few simple tools found in the kitchen and a pretty selection of flowers, you can create a countless variety of beautifully intricate photographs. Whether you are looking to update your portfolio or searching for something to do on a rainy day, these eye-catching floral sculptures are definitely worth braving the cold. Share your frozen flower photos in the comments below! You could also give this a try: How to do Frozen Object Photography at Home. The combination of ice and organic material is simple and striking, even as the ice begins to crack. A small section of an autumn leaf protrudes from the ice.